> When I left for this year’s vacation I had visions of writing blog entries, even without photos, to share all the experiences right as they occurred. Didn’t happen! My time on the computer was terribly limited, and even though the ever present urge was there, I did realize it was better to enjoy the great outdoors! For over a decade now our summer vacation has been sailing in Maine. We’ve spent most of that time in the Penobscot Bay area. This year we started a bit west of that, in Booth Bay. 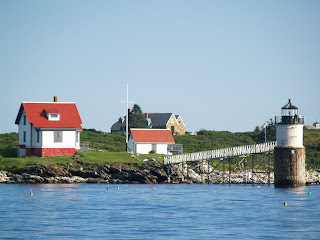 We’ll be back in early September for two more weeks of sailing, and we may take time then to better explore Casco Bay. 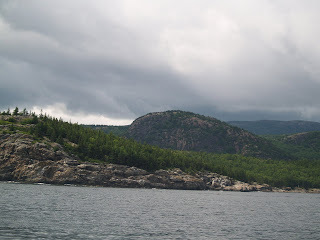 This year’s trip was the coldest we’ve experienced, and it rained every day except two! And when I say rain I mean torrents some of the time. It’s not easy being on boat in the rain. No matter how big the boat is (and while ours is not huge it has grown somewhat over the past 30 years) rain makes everything feel damp….clothing, bedclothes, the upholstered settees in the main cabin….all damp…and cold! I brought three knitting projects, some beautifully dyed mohair top for spindling, and my smallest copper pipe loom set up with a four-selvedge warp for trying a little Pre-Columbian historical study. I did not weave at all. We spent long days sailing, and I can only weave at anchor. I did spend a lot of time knitting, so I was able to complete the cute Minnowknits Scallopini sweater for my niece. Photos to follow soon, I hope! I spent maybe 20 minutes, total, spinning. Still, I could not have gone sailing without the potential for working on these projects. I left the pipe loom and weaving yarns on the boat for when we return in September. Surely, I’ll be more successful then…. Almost every morning I drew for a while, and I did a lot of thinking about weaving and thinking about a design for a Hudson River tapestry to commemorate the quadricentennial. 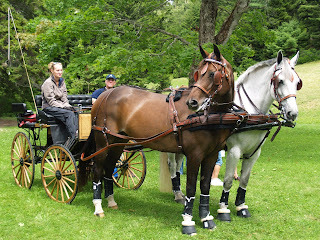 The highlight of the trip was stumbling on an acquaintance from New Jersey who brings his wife’s horses and a carriage even (!) to Mt. Desert each year. 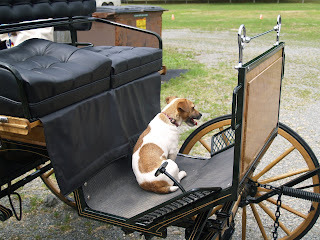 He invited us to go for a carriage ride! The carriage is a beautiful piece of workmanship, hand made by Amish craftsmen in Pennnsylvania. It looked like a carriage straight out of Jane Austen, and I need to find the appropriate name for this kind of vehicle. It was a beautiful day (no rain! ), and we drove through the the Rockefeller carriage trails to Long Lake where we stopped for lunch near a scenic view with a boat house. I still can’t believe it really happened. 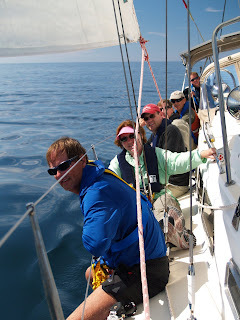 To get to Maine, my husband did a Category 2 Ocean race called the Lobster Run with a crew of seven. He spent about eight months getting our boat ready for this kind of race, and he was happily repaid with a wonderful second place trophy! Our older son was one of the crew. Now that we’re back home, we have a little over one week to get ready for that same son’s wedding. I’m in a constant state of happy excitement now! For over a year now the wedding has been something that has required planning, discussion, dreaming, but actually it didn’t feel REAL…..now it’s about to be a reality! This entry was posted in knitting, spinning, vacation, weaving. Bookmark the permalink. >Jane also talks of phaetons. Very cool to see one! Sounds like a lovely vacation. Enjoy the son’s wedding! I think we moms enjoy them even more than the kids do – less stress on us!